Last weekend we traveled to southern Vermont to attend a good friend's wedding. Through our travels we came across meandering, slow trickles of water within vast, scoured channels. We were seeing the results of Irene, a year after the fact. 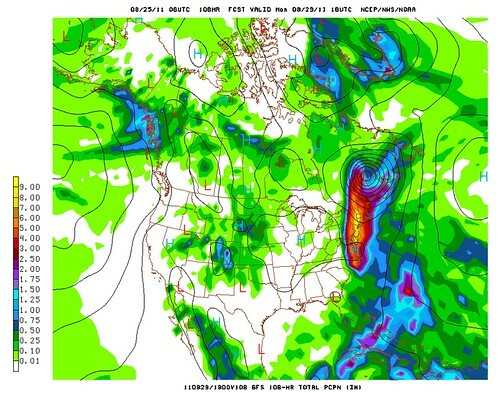 Above, the GFS computer model predicts torrential rains in Vermont, four days in advance. My friends and anyone else who was reading this blog a year ago will remember that we were evacuated from East Middlebury, where severe flooding took place. 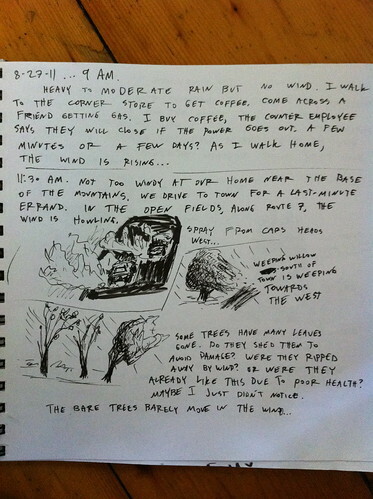 I'd been taking notes about the storm while it happened, but they end abruptly when we were told we had to leave. 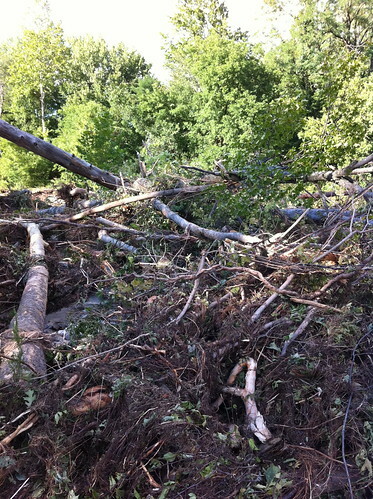 Above: flood debris left in the Middlebury River by Irene. East Middlebury was mostly spared, but other towns were not as lucky. As everyone now knows, the damage was catastrophic in many places. Many homes were destroyed and many more were trapped in their rural homes for many days. Thankfully, Vermont is sparsely populated and people are usually prepared for holing up for a few days, often during blizzards. The peak of the floods happened during the afternoon on a Sunday, so few were on the roads and people didn't have their homes collapse while they slept. The death toll was very low. After the storm, people pulled together. We went to help out in Brandon, though many people did much more than we did. Websites, blogs, Google maps, and Twitter were widely used to coordinate repairs and volunteer efforts. The response was positive and very touching. Sadly though, a lot of damage to rivers was also done in the days after the storm, as people struggling to repair roads and protect themselves against the fear of future flooding took to the rivers to remove gravel and shore up levees. 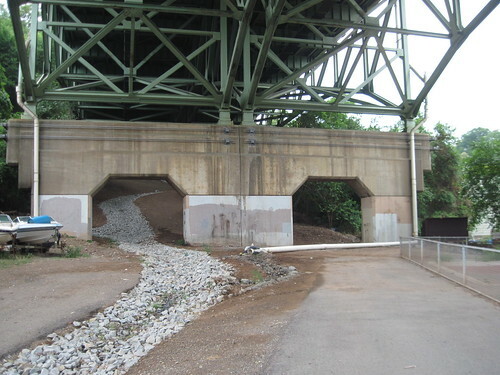 It seemed logical to many that removing gravel and straightening rivers might prevent future floods, but in reality, it can cause a lot of damage and make future flooding worse. I'm all for smart flood control and engineering that saves lives and homes, but in my view and that of many others, many of these projects did long-term damage to the rivers and also made them less safe in the future. 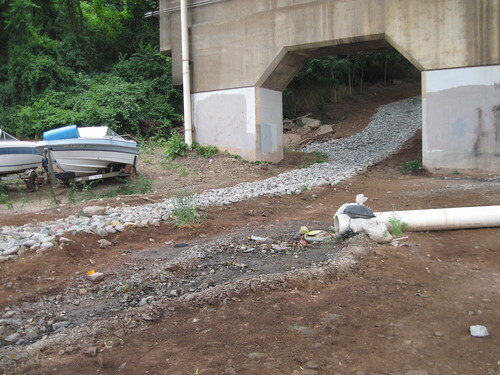 Even yesterday, a year after Irene, in many areas the aftermath of these projects was still visible. 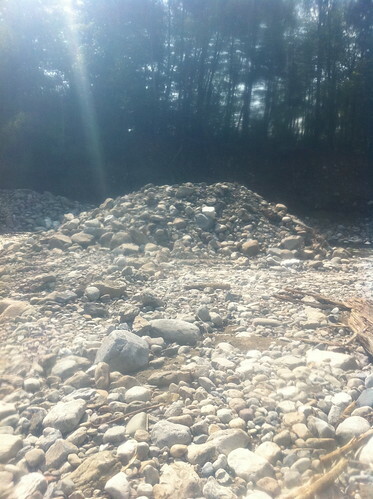 Above: a pile of rock left in the Middlebury River after attempts at gravel removal and river channelization were halted. 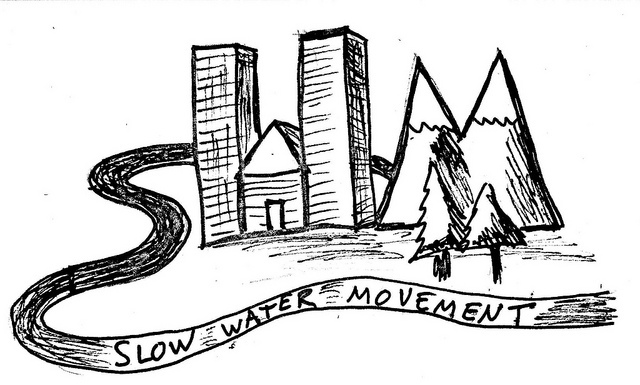 The issue was very contentious in East Middlebury, with many people believing that these efforts, while very damaging to the river, made people safer. I still strongly disagree a year later. Over the last year, the rivers have been adjusting to Irene's aftermath and the modifications people made to the rivers after the storm. It's been a dry year since then, and it has seemed like after Irene's passage the extreme weather of the previous year turned off, like a switch had been flipped. The fall was uneventful for the most part, the winter mild and boring (and a failure for snow), and the spring only notable for an extreme warm spell. This summer has been a warm and dry one, punctuated by a few severe thunderstorms that brought more wind and lightning than flooding. As summer winds down, there are no big storms immediately evident in the future. This year's 'I storm' could cause quite a few problems on the Gulf Coast, but if it brings anything to Vermont, it will probably just be needed rain. Vermont has bounced back. Just as the forests regrew after their deforestation in the late 1800s, Vermont has culturally and economically and emotionally rebounded from Irene. We're not fully healed, but we've made good progress. Hopefully nature spares us any hurricanes this year, and the rebounding process can continue. If anyone is interested in the history of hurricanes impacting New England, and doesn't mind some meteorological jargon, they should check out this scientific document, which my friend called to my attention this weekend. Irene was a nasty storm, and hopefully one we won't see the likes of for the next century, but in all likelihood other hurricanes will affect Vermont in the following decades. We would be wise to prepare for them in both the sort term and the long term. Last year around this time, while Vermont enjoyed the warm later summer days that came before Irene, Pittsburgh was slammed with flash floods. 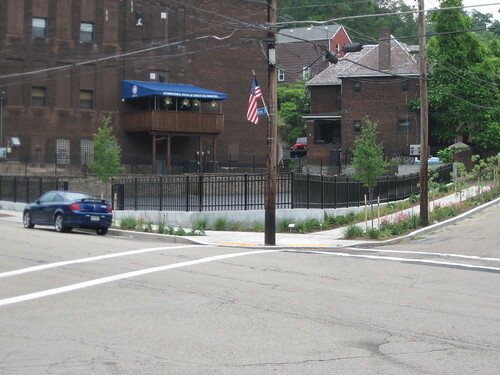 Negley Run was inundated in stormwater-sewage overflow, causing the tragic loss of four lives, and the small neighborhood of Junction Hollow was flooded with raw sewage, for the fourth time in the last ten years. I posted the post above as part of an effort to bring attention to the problem, which could only be solved through entire-watershed effort. Around a year has passed since those most recent floods, and this summer has brought good news. 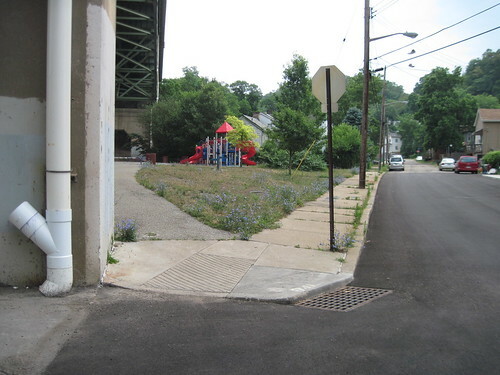 The problem isn't solved yet, but progress is being made and things are improving in Junction Hollow. Laura Shaffalo recently sent me these pictures of Junction Hollow. They show work being done to improve drainage and reduce the chance of sewage overflow in the neighborhood. 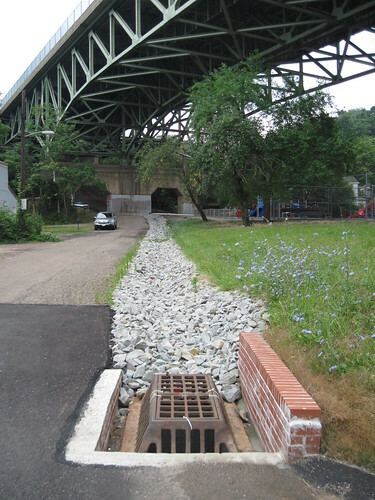 In conjunction with work being done higher in the watershed, including restoration of the Panther Hollow watershed that drains into Junction Hollow, this work should help to reduce the risk of sewage floods in Junction Hollow and also improve water quality downstream in the Ohio and Monongahela rivers. This is quite an improvement from when the drainpipe was mixing with raw sewage and added to the floodwaters that were surging near a playground, as seen in this video I posted in last year's post. Efforts like these are great news and are especially important in light of the fact that more conventional 'grey water' solutions are extremely expensive and often unaffordable. 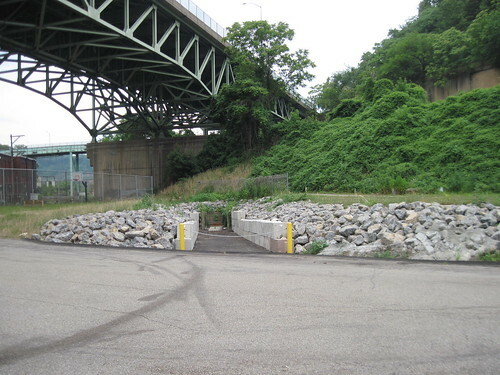 I haven't been to Pittsburgh for a while, so I haven't seen the progress being made in other parts of town. If you have any photos or updates, please post them here or send them to naturalist.charlie at gmail dot com and I will post them. And, on a final note, while googling recent Pittsburgh water news I found this story. Water that soaks into the aquifers doesn't just disappear, but can be used again later! It's been a long, dry summer in most of the United States. Vermont hasn't had as severe a drought as most areas, but rainfall has been below average for much of the summer. Recent rains have brought much of Vermont back to its normal wetness, but after such an unrelenting summer, I've started to think about fall. So have the trees, apparently. Don't get me wrong... most of the trees are as green as ever. Still, just a few trees... trees in unusually wet or dry environments, or trees that are otherwise stressed by their environment... are starting to show a few vivid colorful leaves. 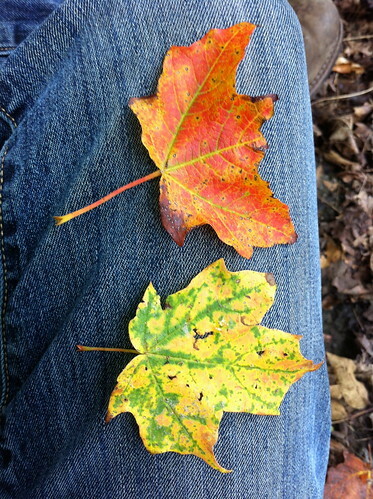 I've only been through three Vermont autumns, so I often find myself wondering when and how each tree species will respond to the changing weather. It's been more than just a casual question, lately, because I've been mapping a lot of natural communities at work, and in many cases vivid fall foliage is available in photos! I see a rainbow of colors across the landscape, but often wonder what exactly I am looking at. The red trees above are probably red maples; the yellow ones perhaps black ash. It's hard to say though (Which ash species again was it that turns purple? White ash?). To answer these questions, I started a fun citizen science project on iNaturalist. 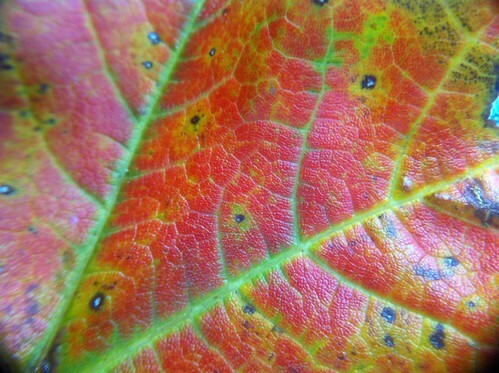 iNaturalist is a great place to track the color of leaves, because each observation comes with a photo, a location, and a time. If I get enough people adding to this, we could build up an expansive database of how leaf color varies over the year and from year to year. Not only will that help me make maps of different natural communities, but it will help track how our changing climate affects the life cycle of our trees as well. Besides... everyone loves pictures of fall color, and most people are taking these photos anyway. This will be a fun way to share them with others. This project is a place to document and share color patterns. I'm most interested in anything you can see in a high-resolution aerial photo - not just overstory trees but wetland and meadow plants as well . 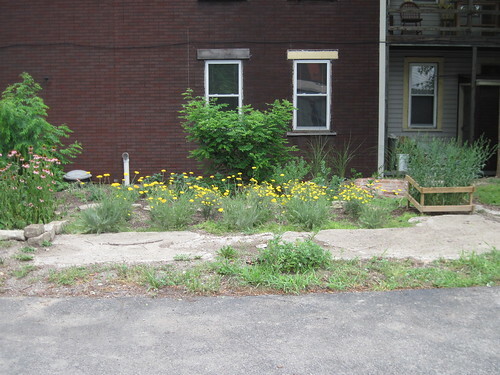 For instance, the goldenrods that bloom in late summer can definitely be seen from aerial photos. Even the patterns of sphagnum moss in bogs can sometimes be seen from above. Remember... location and date are important for this project, so if you aren't sure where or when a photo was taken, it's probably better to leave that one out. Check back with this post to see updates below! Last month I swapped watersheds. For a bit over a year, I'd been living in the Otter Creek watershed, and more specifically in the Middlebury River watershed. I watched the Middlebury River from the end of one of the snowiest Vermont winters on record, through a very wet spring and summer culminating in Tropical Storm Irene's horrible flooding, and then through fall and into another winter (albeit a somewhat feeble one). I watched the equally feeble spring snowmelt lead into an early summer of mostly low water, with a notable exception. Through it all, I was trying very hard to find employment within my field in Addison County. Ultimately I realized I was going to have to either give up my home by the Middlebury River or my passion for working in the conservation and ecology field. The latter won out, and along with my girlfriend finding a job in the same area, we relocated to Montpelier, in the Winooski River watershed. 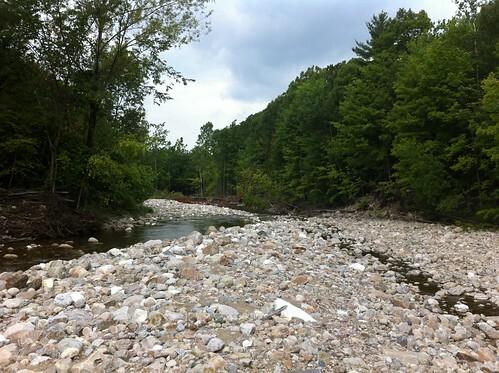 Above: The Winooski River, a ways downstream from Montpelier. I'd lived near the Winooski before, when I lived in Burlington, and while I technically wasn't living in the watershed, I spent much of my time in the watershed, including my wanders in Centennial Woods and some of my time on the UVM campus (it's hard to say where the watershed line passes through campus, with all the human modifications to the runoff in the area). 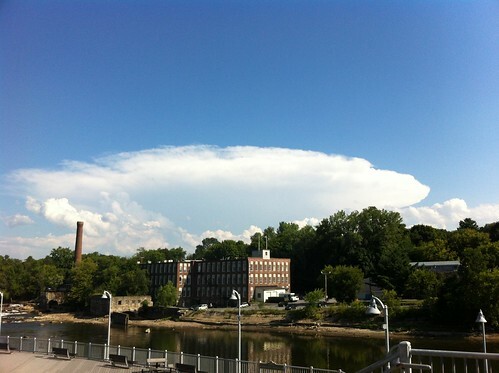 Above: A distant severe thunderstorm, and the Winooski River flowing through the town of the same name. Montpelier is much further upstream than Burlington, and has its own weather and ecology and culture. It's surrounded by mountains, and picks up different storm tracks. There seems to be slightly less summer rain and, from what the records indicate, significantly more winter snow. Transitions can be difficult, especially those we don't really choose. I'm excited to live in Montpelier, but also was sad to leave Addison County, the Middlebury River, and my friends in the area. I will still see my Addison County friends often - especially those who are moving to Burlington for the same reason I left - lack of jobs. But, I won't be watching the changes of the river anymore. Last weekend I was back in Middlebury to see friends and go to the Midd Summer Festival. I also got a chance to visit the Middlebury River. It's been a MUCH drier summer than last year, and the water was very low - much lower than it ever got over the time I lived in East Middlebury. As always when visiting an old home, most of the residents are still there when you go back . This includes my friends, and also the foxes I've seen many times. In addition to these fox tracks (They are fox tracks, right? Dogs also frequent this area along with local human residents) I saw a fox, but it was too far away to photograph with an iPhone. I also saw a large great blue heron, which I kept irritating as I moved downstream. Note also the saplings. In the old oxbow cut area, there were hundreds of cottonwood seedlings. 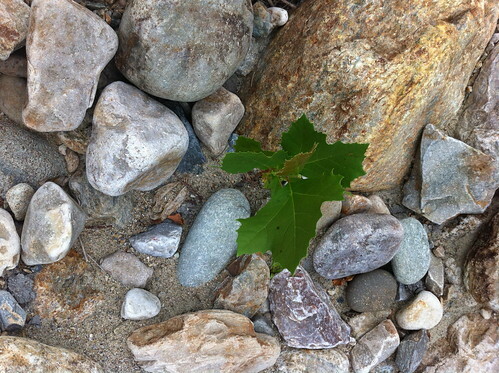 I also found this sycamore seedling. Life is moving on. One of the most important and difficult lesson rivers have to teach us is that of the constancy of change, even in my absence. In the month since I'd last seen the river, water had been steadily flowing downstream the whole time, meandering a slower than usual path due to the dry weather. 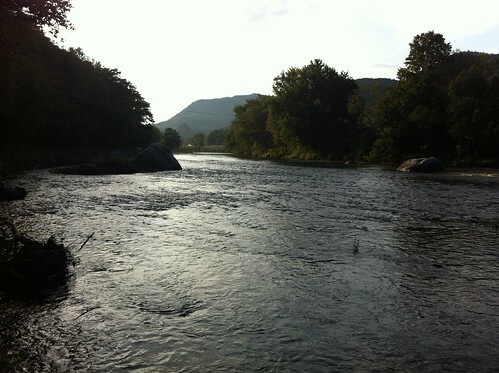 Trees were colonizing the areas laid bare by Irene and the recent flash flood, the fox and heron were hunting, other East Middlebury residents were enjoying the swimming and fishing holes, and life generally was moving forward. This river has existed in one form or another for millions of years, probably even flowing to some extent under the ice during the great ice ages. No matter what humans do, and how we humans treat each other and the world around us, the river will keep flowing, until it completely erodes away the ancient mountains or until the sun goes nova in billions of years and vaporizes the Earth's water. We talk about protecting the river, but the river will always be the river. What we really are protecting is our relationship with it; our ability to enjoy it and use it, not only to provide water, fish, and scenic beauty, but to share its stories and its lessons for anyone who is watching.